Vaccines are constantly exposed to environmental conditions such as transport, storage and handling that have the potential to deteriorate the potency of immunizing agents. The degradation of immunizing agents in vaccines may result in the failure of the agent to stimulate an adequate immune response, leading to lower levels of protection against disease. Proper equipment and procedures used in the cold chain process ensure that vaccines are protected from environmental factors that can cause the deterioration of immunizing agents. Below you will find resources to help you support the proper storage and handling of immunizing agents. 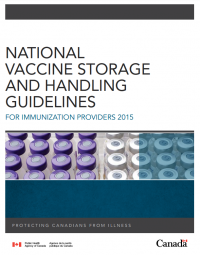 The objective of the National Vaccine Storage and Handling Guidelines for Immunization Providers (2015) is to provide recommendations for vaccine storage and handling for immunization providers. Specific recommendations for vaccine storage and handling procedures may vary among public health offices and immunization programs; therefore, the document is meant to supplement existing policies rather than replace them. Developed by the Vaccine Storage Guidelines Task Group (composed of membership from the Canadian Nursing Coalition on Immunization, the Vaccine Vigilance Working Group of the Canadian Immunization Committee, and the Public Health Agency of Canada). 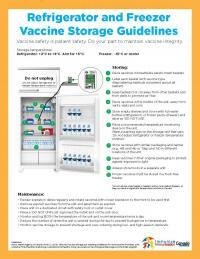 This tool is a checklist for safeguarding the storage and handling of your vaccines. Vaccine safety is patient safety. Do your part to maintain vaccine integrity. 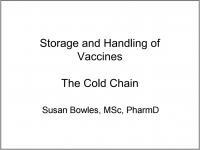 Description: The webinar offers health professionals and immunizers alike an opportunity to maintain competencies in practices related to cold chain procedures. Webinar recording and webinar slides. This webinar was made possible with funding from the Public Health Agency of Canada.